View More In Semi-Automatic Espresso Machines - Page 2. The Pro 500 is a prosumer grade semi-automatic espresso machine designed by Profitec to be both functional and user friendly. The Pro 500 includes numerous high quality components such as the much renowned E61 brew group, the copper and braided steel water tubing or the Ulka EX5 vibration pump. Wrapped in attractive and durable stainless steel housing, the Pro 500 aims to impress with both form and function. Internally, everything rests on the one-piece steel frame that runs from the back of the machine all the way to the drip tray. Profitec has insulated the hot water and steam wands have also been similarly insulated to prevent accidental burns. The E61 is made of solid brass and constantly heated by the heat exchanger and thermosyphon system which constantly circulate hot water through the group head. Steaming is accomplished by the Pro 500's insulated two-hole steam wand and can be executed in tandem thanks to the heat exchanger system. Another feature of note are the spring loaded steam and hot water valves. These valves are unique because they don't need to be fully opened or closed to regulate the flow of steam/water. The way it works is that by turning the knobs, pressure is either added to or released from a spring that holds the valves shut, this prevents you from having to rotate the knobs numerous times to open or close the valves. To help prevent damage to the machine, the water reservoir is fitted with a low volume sensor that automatically shuts of the boiler to keep it from running dry. The Pro 500 will alert you of low water volume with the orange light located directly below the power switch. 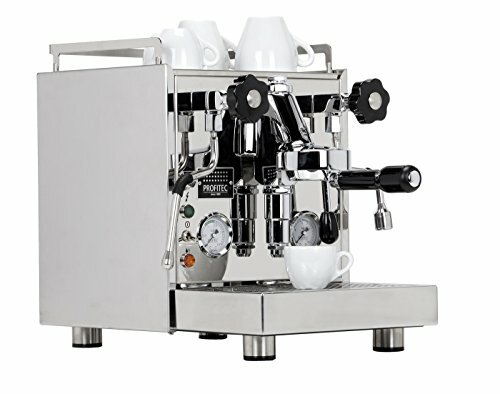 At the end of the day, Profitec's main goal has been to provide the home barista with a singular espresso machine experience, a goal handily by the Pro 500 espresso machine. Built on a solid foundation, the Pro 500 has a one-piece steel frame and is housed entirely in mirror finished stainless steel. Renowned for its contributions to maintaining temperature stability in professional grade espresso machines, the E61 group head rests like a crown on the Pro 500. Constantly heated with water from the thermosyphon system, the solid brass E61 also features a pre-infusion cylinder to wet your grounds with low pressure water prior to brewing to aid in the extraction process. The Pro 500 boasts an impressive 3 liter water reservoir fitted with a low volume sensor that automatically shuts the machine off to prevent the boiler from running dry. Internal pump and boiler pressures are displayed on the front of the machine by the Pro 500's dual gauges, allowing you to keep an eye on things. If you have any questions about this product by Profitec, contact us by completing and submitting the form below. If you are looking for a specif part number, please include it with your message.